Garages do not always get the attention they deserve. You may not include them in photos when you are trying to sell your house, and you may take great pains to keep guests from seeing the inside of your garage. A garage may seem like an afterthought when you consider a home, but your garage may actually be the most important space in your house. Here’s why, and how you can bring out the best in this key area. Your garage has a significant potential for storage. A few hundred square feet may not sound that impressive when compared to a house of, say, 2,000 square feet, but there’s an important difference. While your house is filled with furniture and clutter, your garage can be almost entirely dedicated to storage if you want. You can keep memorabilia that you cannot bear to throw away, extra furniture, emergency supplies, and gear for hobbies such as surfing, camping, and biking. It can also store your second most valuable possession after your home – your car. Your garage can also store tools for fixing and building. Treat your garage right to protect your storage space and belongings and give them the respect they deserve. Make the most out of your space and keep things organized by investing in some custom cabinets and appropriately sized storage bins. Keeping things organized makes your garage more pleasant to be in, and helps you keep track of where you put things. Plus, a good-looking, well-maintained can increase your property value. A filthy garage is unattractive, and it could be a deal-breaker, even if the potential buyer does not realize it consciously. In addition to painting the interior and exterior, you can redo the floors. This will help you easily keep your garage and belongings clean and attractive. An epoxy flooring is the ideal solution because it offers increased traction. It also reduces risk of slipping because it resist oil stains. It is easy to clean, so grime does not pile up. Between the valuables that you keep in your garage and the floor treatments and other work you are investing in your garage, your garage needs to be protected. Consider security features that go beyond the door. 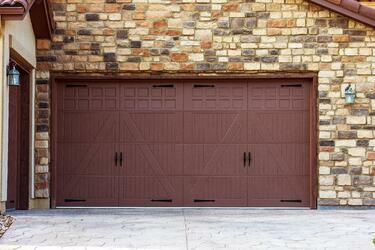 Think of your garage as a place as important to protect as your house. Get a sturdy door that locks. If you use an automatic garage door opener, it may be time for an upgrade to one that has “rolling code” technology instead of “code grabber” technology, which thieves love. Just like you do with your house, do the following. Keep the bushes trimmed so people cannot hide. Install motion detector security lights. Your garage protects your most valuable belongings and gives you an unequalled storage space. Keep its floors and storage utilities looking up to par, and keep it secure. Request a free mailed idea brochure today to begin the process of maintaining your new and improved garage.